(c) Alicyclic (terpene and sesquiterpene) alcohols. These three distinct categories of ‘alcohol volatile oils’ shall be discussed briefly along with certain typical examples from the plant kingdom. 2.6.5.2.1 Acyclic (Aliphatic) Alcohols In general, a number of acyclic alcohols, such as: methyl, ethyl, isobutyl, isoamyl, hexyl and other higher alcohols occur widely in volatile oils, but being water soluble they are usually eliminated during steam distillation. which shall be discussed along with suitable examples. monohydroxy alcohols belonging to the paraffin series, most of which are found to be esterified with fatty acids. In the course of steam distillation these esters undergo hydrolysis to yield the lower members of saturated aliphatic alcohols together with the lower fatty acids rarely. constituents e.g., methanol, ethanol (a by product of fermentation due to plant starches), furfural and butanedione (diacetyl), which ultimately are located in the distillation waters of volatile oils. Isolation of aliphatic alcohols may be accomplished from the volatile oils by fractional distillation, by forming their respective derivatives e.g., para-hydroxybenzoates, acid phthalates and calcium chlorides. The saturated aliphatic alcohols may be identified by the preparation of their respective cyrstalline derivatives, such as: para-nitrobenzoates, 3,5 dinitrobenzoates, phenylurethanes, and napthylurethanes. The presence of ethanol as an ‘adultrant’ in volatile oil may be carried out by treating it with iodine, potassium iodide, sodium hydroxide solution (0.5N) and heating the resulting mixture to give rise to the yellow crystals of iodoform (mp 119oC). 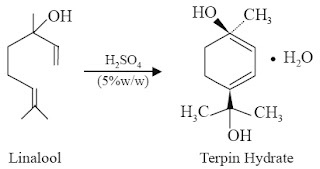 Occurrence It is an olefinic terpine alcohol which constitute the major part of oil of rose, oil of palmarose (95%), oil of geranium (40-50%), oil of citonella (30-40%) and also in the essential oil of lemon grass etc. [2C10H18O CaCl2]. The resulting compound is practically insoluble in organic solvents, such as: chloroform, ether, petroleum ether or benzene and hence can be readily decomposed with pure distilled water into geraniol and calcium chloride. The separated oil thus obtained is rapidly washed with luke-warm water and subjected to steam distillation finally. Method 2: It may also be isolated and purified, of course, much less conveniently, by forming its solid acid phthalate (mp 47oC) which yields a crystalline silver salt. Characteristic Features It is an oily liquid having a marked and pronounced agreable rose-like odour. However, the odour of its geometrical isomeride ‘Nerol’ is definitely found to be more refreshing than that of geraniol. bp757 229-230oC; d204 0.8894; n20D 1.4766; UV max: 190-195 nm (ε 18000). 1. It is characterized conveniently by preparing its specific derivatives, for instance: 3-nitrophthalate (mp 109°C) diphenyl urethane (mp 82.2°C), and α-naphthylurehane (mp 47-48°C). 1. It finds its wide application in a plethora of formulations used as rose scents. 2. It is also employed as insect attractant. 3. It is employed extensively in perfumery e.g. ; butyrate for compounding artificial attar of rose; formate as an important constituent of artificial neroli oil and of artificial orange blossom oil. 4. It is used in soap, cosmetic and flavour industries. Occurrence It is the major constituent of linaloe oil. It also occurs in a variety of essential oils, namely: Ceylon Cinnamon (Cinnamonum verum), Artemisia balchanorum, Acorus calamus, Aloysia triphylla, Artemisia dracunculus, Camellia sinensis, Cananga odorta, Glechoma hederaceae, Humulus lupulus, Lantana camara, Laurus nobilis, Lavanchula angustifolia, Myrica, Myristica fragrans, Narcissus tazetta, O. imum basilicum, Peunus boldus, Piper nigrum, Prunus armeniaca, Robinia pseudoacacia, Rosmarinus officinalis, Salvia, Satureja, Syzygium aromaticum, Thymus and Tilla europaea. Isolation It is conveniently isolated from the saponified volatile oil by subjecting it to careful fractional distillation. (a) Organic Acids: It is very sensitive to organic acids and gets rapidly isomerized to geraniol. Hence, its esters cannot be obtained in the purest form by ordinary methods. (i) With Chromic Acid: It undergloes oxidation to yield Citral. (ii) With Formic Acid or Conc. Sulphuric Acid: It undergoes dehydration to yield α-terpinene and dipentene. l-form: (Licareol): colourless liquid; bp760 198°C; d20 0.8622; n22D 1.4604; [α]20D -20.1°. 3. On oxidation with chromic acid mixture it gives rise to citral that may be further ascertained by forming its semicarbazone derivative mp 171°C. 1. It is used extensively in perfumery instead of bergamot or French lavender oil because it has an odour quite similar to these essential oils. 2. Its esters, specially the linalyl acetate finds its abundant usage in perfume, cosmetic, soap and flavour industries. Occurrence Nerol is found in a number of essential oils, specifically oil of Neroli (usually obtained from the fresh and tender flower of orange), oil petit grain (normally prepared from not fully matured fruits of bitter orange) and also in oil of bergamot (conventionally prepared from Citrus auranti var. bergamia). 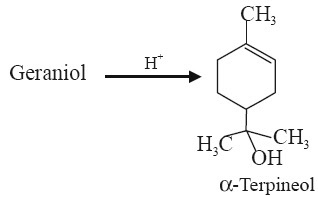 Isolation Nerol may be isolated from admixture with geraniol in volatile oils by treatment with anhydrous calcium chloride, when the former that does not form any complex with CaCl2 is separated conveniently by either centrifugation or filtration techniques. Characteristic Features It is an oily liquid having the odour of sweet rose. It is optically inactive. It has the physical parameters as : bp745 224-225°C; d15 0.8813; UV max: 189-194 nm (ε 18000). It is soluble in absolute alcohol. 1. It is characterized by the preparation of its tetrabromide derivative C10H18Br4O (mp 116-118°C). 2. It also gives rise to the diphenylurethane analogue (mp 52-53°C). 3. It forms needles of allophanate (C12H20N2O3) (mp 84-86°C) from petroleum ether (40-60oC). Uses It is used extensively as a base for the manufacture of perfumes.